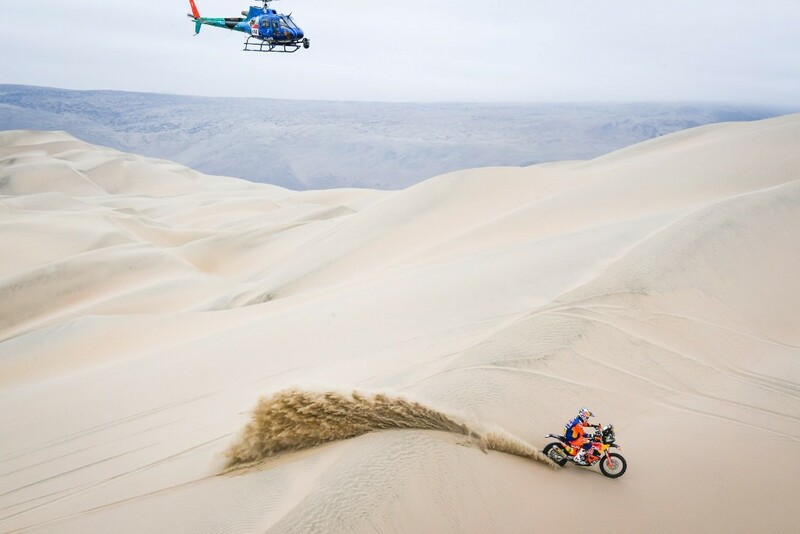 Well the dust and noise has died down In Peru, with the end of the 2019 Dakar Rally seeing a mix of the unexpected and per-the-usual results. With wrenches thrown into the gears of many top-level riders’ efforts, this year was about battling on and not losing hope. Diehard race fans already know the numbers and details, so let me give you, dear reader, a bit more of a story than just who finished where. If you aren’t up to speed at all let me suggest our recap of the first half of the rally, covering stages 1-5. We’ll talk about the action up front but that’s also what everyone else is talking about, so I’d like to take a look at a few of the stories throughout the field. There are people riding totally unassisted in the Originals class. There are couples racing together. There are some notable finishers outside of the top-10 that deserve mention. But first let’s look at the front runners. We came out of the rest day with American Ricky Brabec (#15) looking especially good. The Honda factory rider is in only his third Dakar—a largely European dominated race—posting two stage wins and leading overall. Two of his main rivals were also injured. Last year’s winner was KTM’s Mattias Walkner (#1), who hurt his ankle on a hard landing. KTM also retains the services of 2016 winner Toby Price (#3). Toby had a scaphoid surgery (a bone in the wrist) to his throttle hand just weeks before the beginning of the event and the pain he was enduring was obvious. 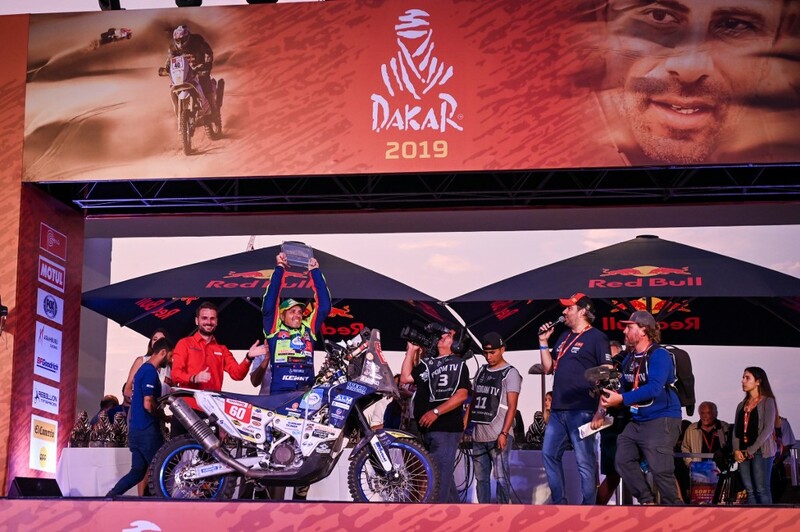 This meant Brabec’s biggest threat was likely to be Husqvarna mounted Pablo Quintanilla (#6), who was fast and seemingly immune to mistakes during the timed special stages. Coming out of the rest day Pablo Quintanilla (#6) won stage 6 and took the lead overall, but that meant he had to be the first rider out on stage 7. This lets your competitors follow in the tire tracks of others, making it easier to navigate as well as to spot pitfalls. Amazingly, Quintanilla lead most of the stage but fell way behind in the end, taking 14th on the stage and falling to 5th overall. The news for stage 8 was all about Ricky Brabec. His engine let go at kilometer 56, a terminal failure that would end his Dakar for the 2nd time in a row. That left Honda’s front man being Jose “Nacho” Cornejo (#10), who was more than an hour off the new overall leader Toby Price. This is because Honda’s Kevin Benavides (#4) was hit with a three-hour penalty for concealing course notes on his bike. 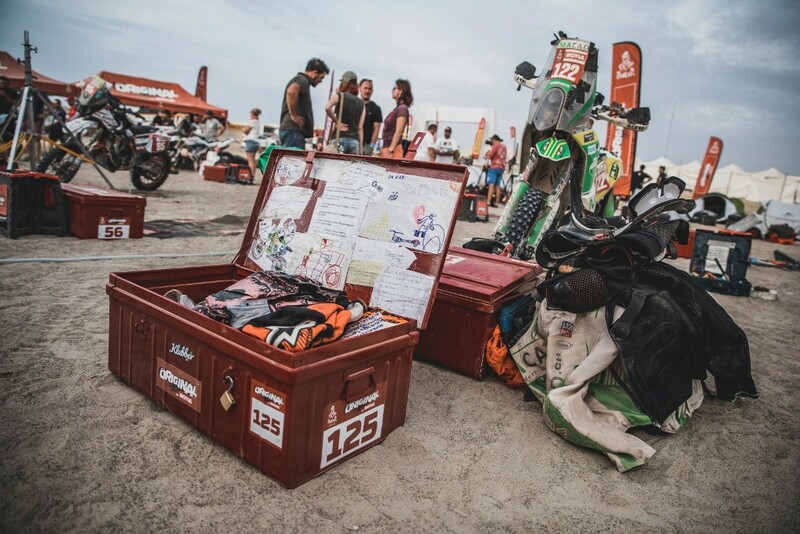 The roadbook issued by Dakar officials is the only form of navigation allowed during the rally, and because Benavides concealed the notes at the start line, ASO officials considered it unsportsmanlike conduct. The penalty put Benavides out of contention for a decent finish, and he would end the rally in 12th. Once again it looked like KTM would dominate the Dakar, with the top four runners being either on the orange bikes or riding their sister brand, Husqvarna. Nacho Cornejo was actually a privateer in 2017 when he was tapped by the factory to replace and injured rider. He did so well it earned him a spot with Honda this year. He did not disappoint. Photo: ©ASO DPPI. Stage 9 would normally be the last “real” stage of the rally. The final stage is usually quite short and more like a parade. This year the timed special stage for the final day was 112km. Still short mind you, but long enough to be the most decisive stage of the rally. And that’s because of how stage 9 played out. Instead of going one-by-one, riders were released in packs of 10. This made it impossible to break away, and the top group all finished within seven minutes of each other. This left just over a one-minute gap between overall leader Toby Price and 2nd-place Quintanilla. Both riders were going to have to take risks on the final day, with Price’s wrist giving him huge fits of pain. Stage 9 looked like friends on a massive free ride through the dunes at times. Photo: Red Bull. Stage 9 also knocked Yamaha’s Adrien van Beveren (#4) out of 4th place with engine failure, promoting American Andrew Short (#29) to the spot… far better than his only other Dakar result of 17th place in 2017. On the final day an epic showdown was expected between Price and Quintanilla, but it ended quickly and dramatically. 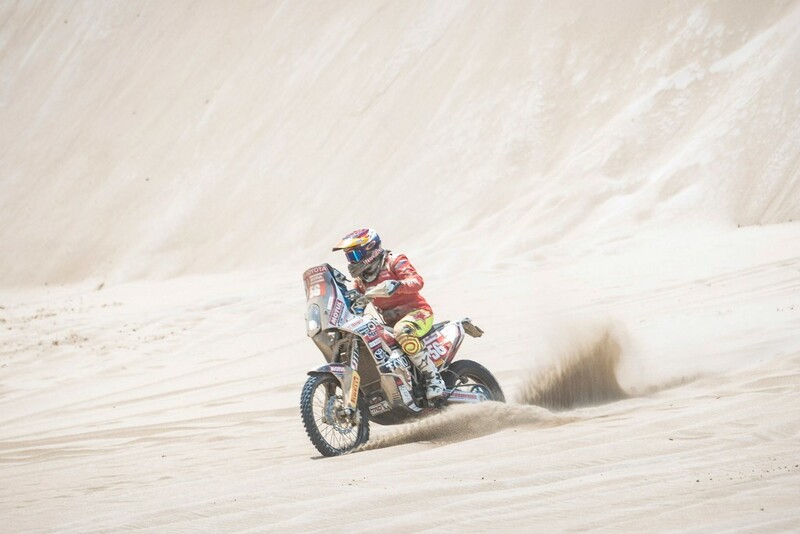 Obviously in a “win it or bin it” mindset, Pablo launched his Husqvarna off a dune only 10km into the special stage. Although the landing was obviously hard, it almost looked like the Chilean rider would ride it out when suddenly he toppled off the left side of the bike, his ankle broken. Medical staff looked after him at the scene and he eventually remounted to finish the day 23rd, while dropping all the way to 4th overall. 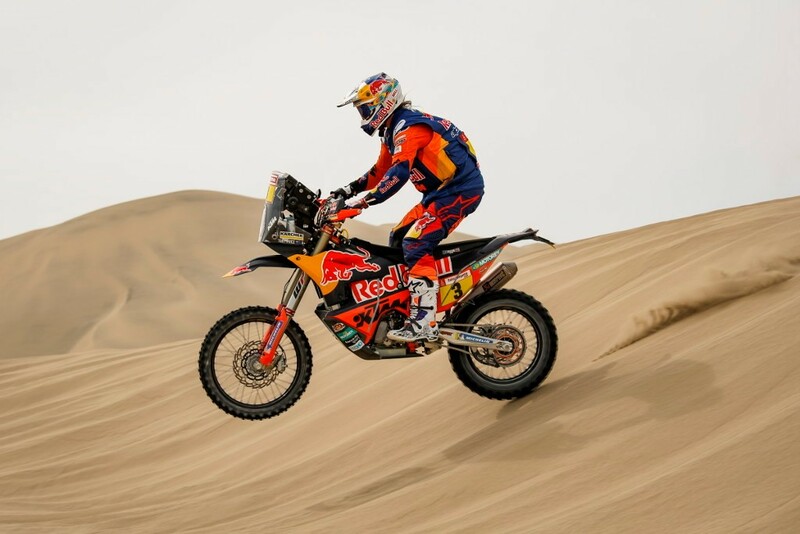 That meant Toby Price, with his injured wrist and all, would take his second Dakar Rally win, and secure an 18th consecutive win for KTM. In fact, with Quintanilla and his Husqvarna dropping to 4th, KTM would sweep the podium. Mattias Walkner was 2nd overall (including a 3-min penalty) and Sam Sunderland would be 3rd. Sam was actually hit with a 1-hour penalty for a malfunction on his Iritrack system. The GPS unit allows officials to track rider locations at all times while also giving riders a warning if they are entering a speed-controlled area or if they have a faster car/truck coming up behind them. Officials decided a missing fuse was removed deliberately to delay Sunderland’s start, ensuring he did not have to be first on the road. The penalty was reversed on appeal. Husqvarna rounded out the top-5 with the injured Quintanilla and his American teammate Andrew Short (#29). 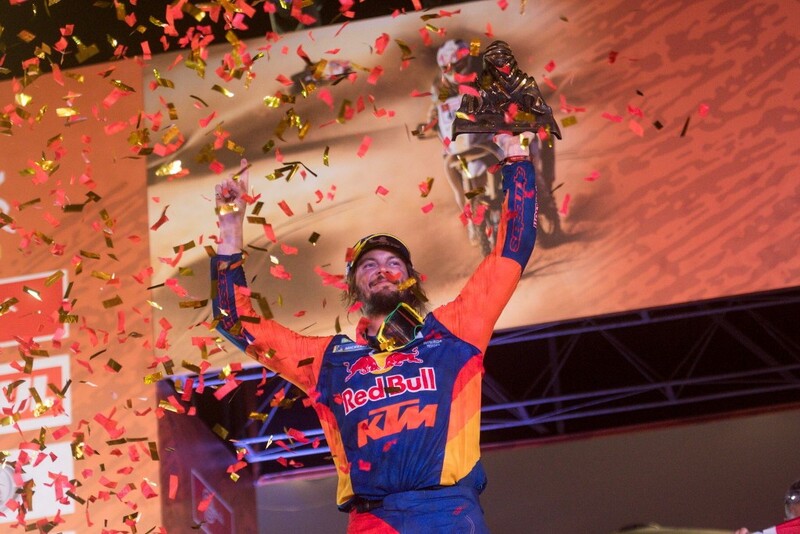 Toby Price earned his second Dakar win while giving KTM an unprecedented eighteen-in-a-row. Photo: Red Bull. Now we can get into the interesting stuff. Let’s first talk about the Originals by Motul class (previously called Malle Moto). As I said in my previous recap, this subcategory requires riders to do the entire rally unassisted. All their tools and spares go into a small container which is shipped by truck from stage to stage. Riders do their own services, repairs, navigation, preparation, and even have to pitch their own tent each night. Riders tend to help each other (which is allowed) and this gives the class, well… class. Their section of the bivouac is full of tents and flashlights, not swarms of mechanics and floodlights. Just finishing is enough to mean you’ll call no man “mister” ‘till the day you die. Even as a fan you have to be an ironman, as it takes a ton of digging on the internet to even find the results each day. Malle moto roughly translate to “Motorcycle box,” and that’s what you get. If it’s not in the box you can still borrow it from other teams. KTM is the most popular choice because they have a truck where you can buy parts on account. Photo: Red Bull. In 31st place overall this year was the Originals class winner, Edwin Straver (#60) of the Netherlands. This was a vast improvement over his 49th overall in 2018: the only other time he raced Dakar. At one point he was over 90-minutes behind class leader Max Hunt (#49), who failed to make it through stage 5. This put Edwin up to third in class, with Mark Tielemans (#123) the new leader. But Tielemans didn’t make the start on the final day. Since I don’t speak Dutch I couldn’t piece together exactly what happened, but a big crash on stage 9 sent him to the hospital even though he officially finished the day. In fact, he finished the day 3rd in class and was still leading. What an ironman. This left Straver with a comfortable lead over France’s Arnold Brucy (#45). Interestingly, Straver’s lead at the end was 4hr 18min over Brucy, who earned a total of 4hr 20min in penalties during the rally. Removing the penalties puts them just 2-min apart after almost two weeks of racing. But of course, those penalties are often earned for skipping waypoints on the course. Sometimes it’s better to take a penalty and get into the bivouac early to do repairs. To finish first, one must first finish. Edwin Straver won the Originals by Motul class through consistency and staying out of trouble. Photo: ©ASO A. Vincent. Another important note in the Originals class is that 2019 marks the first time a woman has finished in the class. 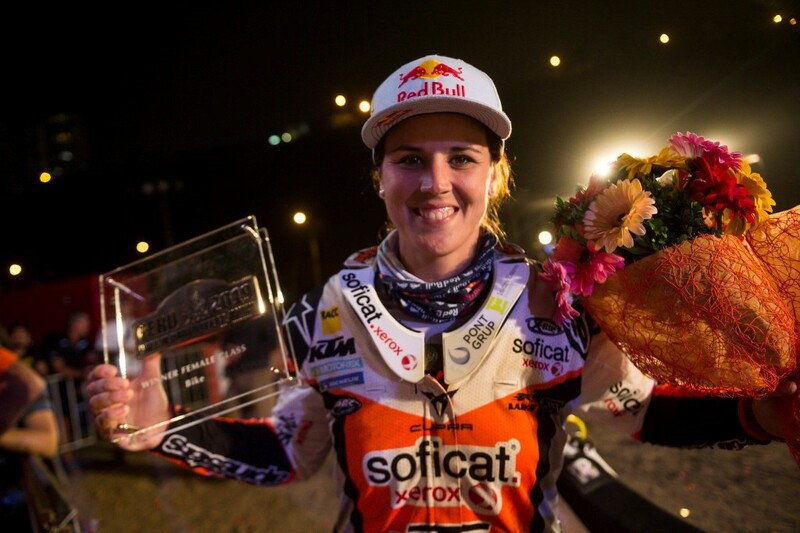 Russian Anastasiya Nifontova (#56) is fairly well know among the community, having competed for years in endurocross and rally raid events around the world. 2017 was her first Dakar, in which I remember her having trouble early on and being nearly out of the race, only to overcome and manage to finish 75th overall and 2nd in the women’s subcategory. Anastasiya is easy to spot in photos and video because she seems to be wearing her trademark smile at all times. Anastasiya Nifontova is rarely seen without a huge smile. Photo: Red Bull. 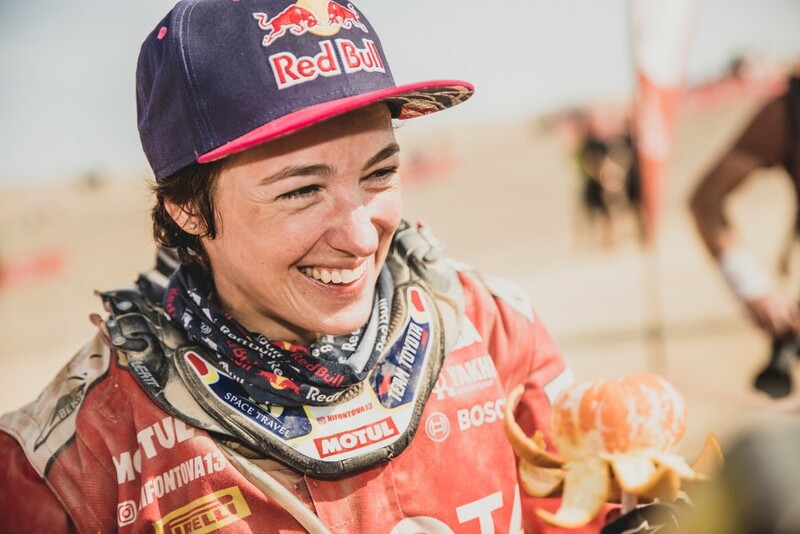 When I first saw her I mistook her for about 25 years old since her smile is so youthful, but the Russian celebrated her 40th birthday just after the end of the Dakar. She came in 8th in the Originals class out of 15 finishers, though all finishers in this class should be proud… they started with 30 entrants. Yes, half the field failed to finish. She was 63rd overall and 3rd in the women’s subcategory, behind Mirjam Pol (#55) and winner of the women’s class, factory KTM rider Laia Sanz (#17). 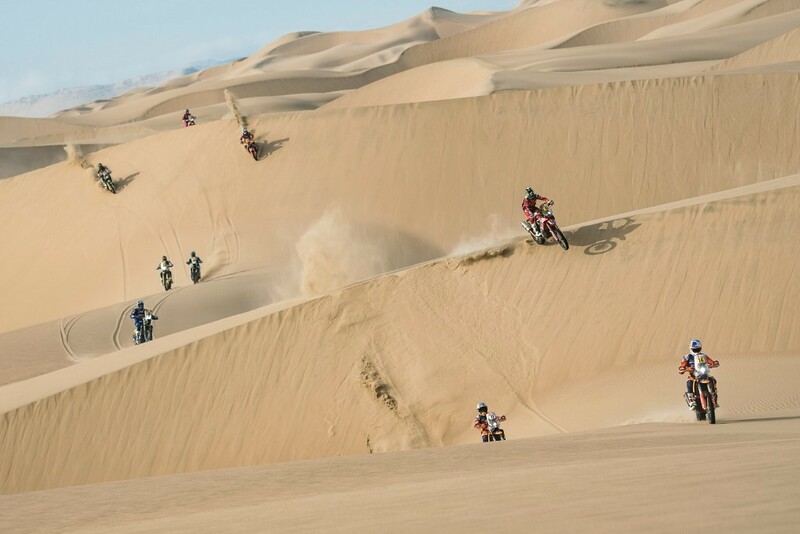 Anastasiya Nifontova, pushing through the Peruvian dunes. Photo: Red Bull. Laia’s 11th place overall is not her best finish (she took 9th in 2015), but it marks her 9th consecutive finish in nine consecutive attempts. It’s hard to believe anyone could have that kind of consistency at age 33, since Dakar is famous for handing disaster to younger riders who can ride fast but fall prey to mistakes. At this point Laia is a fixture in the rally, and aside from a stellar performance she also gave a great side-story for fans. Laia Sanz won the Women’s category and made her ninth consecutive finish. Photo: Red Bull. She bet teammate Toby Price that she could shave his mullet so long as she finished in the top-15. In turn, if Toby made the top-5 he could kiss her for 5-seconds. With both having won their bets, I have to admit that Price looks a lot better with a shaved head, and he took the gentlemanly way out by kissing Laia on the hand for 5-seconds. Another first (actually, knowing Dakar’s penchant for weirdness, this probably isn’t a first) for the rally was seeing a husband and wife entered in the Originals class, riding together. Sara Garcia (#98) and Javier Vega (#99) met while training in Morocco. Both Spaniards, the relationship continued back home while their shared love of off-road racing grew as well. The decision to race together for mutual support is actually rather calculated. Riders in the Originals class aren’t allowed outside help, but being aided by another rider is not considered outside help. Being there for each other adds a layer of protection against the unforeseen, with the added bonus of the psychological factor: being sleep-deprived for nearly two weeks takes a toll on everyone. Unfortunately the fairytale version of this story ended abruptly on stage 4 when an electrical problem brought Sara’s bike to a halt. Despite swapping parts between the two bikes in an effort to find the fault, Sara was forced to abandon her race and be helicoptered back to the bivouac. Javier Vega soldiered on alone and managed a 62nd place finish overall and 7th in the Originals class. 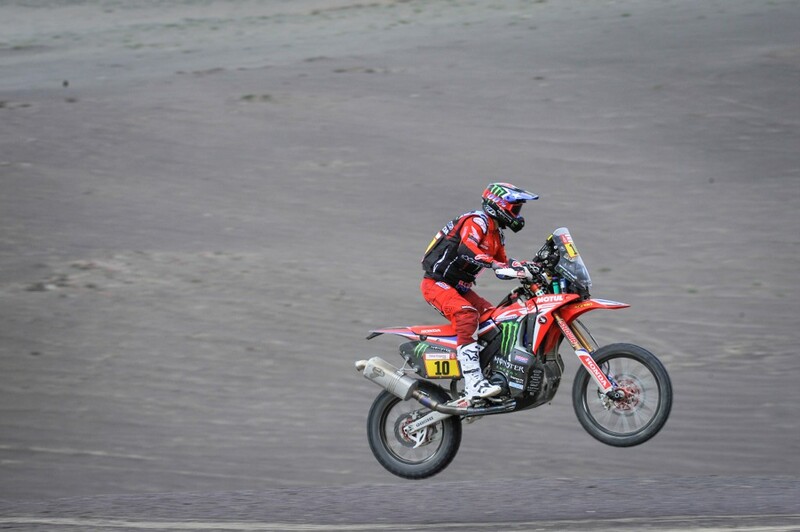 This was the first Dakar appearance for both riders. There isn’t much footage to be had, but this clip from the “Dakar Heroes” series does have clips of Sara and Javier out on the stage (though mixed in with several other storied). If you watch the video, you’ll likely wonder why someone’s windshield explodes at about the 1m 25sec mark. They were being pulled out of a hole and the tow strap broke, striking the truck’s windshield. There is an endless list of stories I’d like to tell from this year’s Dakar, and that’s without mentioning the quads, side-by-sides, cars, and trucks. The race is a race for the top 20 or so competitors, but for the other 100-plus people, it’s the adventure of a lifetime. With Dakar 2019 happening entirely in Peru, there is talk of the great race heading back to Africa. You might have already made the connection between the rally’s name and the capital city of Senegal. It’s not a coincidence; it was the finish line for the original rally in 1979, and nearly every subsequent race until 2008, when security concerns halted the race. South America took the mantle for the next decade, with most events taking place in Bolivia, Paraguay, and Peru. 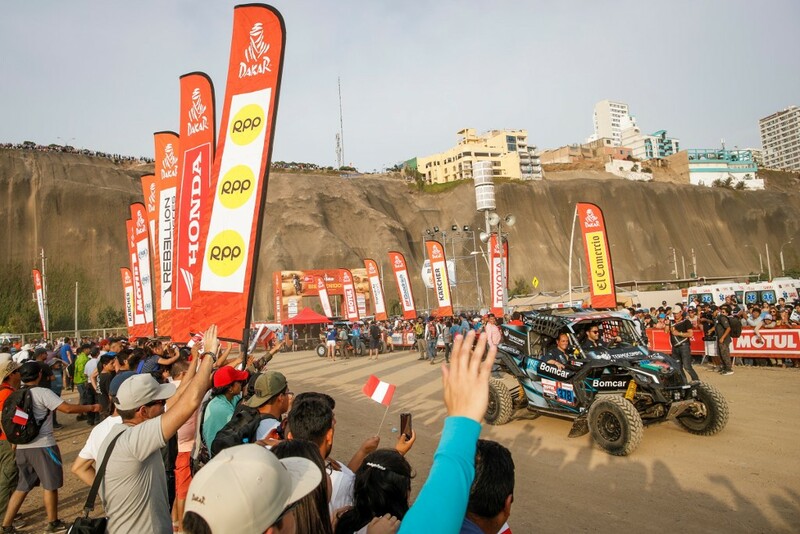 Several years also included Argentina and Chile, but a combination of factors has narrowed the number of locations open to the rally, hence the 2019 event being all-Peru. Truckers went on strike one year, angered over massive road closures for the race. Environmentalists in Chile protested over the damage done from racers and fans heading out to the desert. Historians and first nations groups were upset about ancient sites being disturbed by the race. It’s hard to tell that locals are upset by the impact of the event. Fans are numerous and appear far more responsible than those seen in American and Mexican desert races. Photo: ©ASO; F. Gooden. Dakar officials have been in open talks with African nations for at least a year, and with Chile dropping out of the 2019 event somewhat last-minute, the talks are likely to get more serious. Algeria, Namibia, and Angola have all been mentioned. All have hosted Dakar stages in the 1990’s. 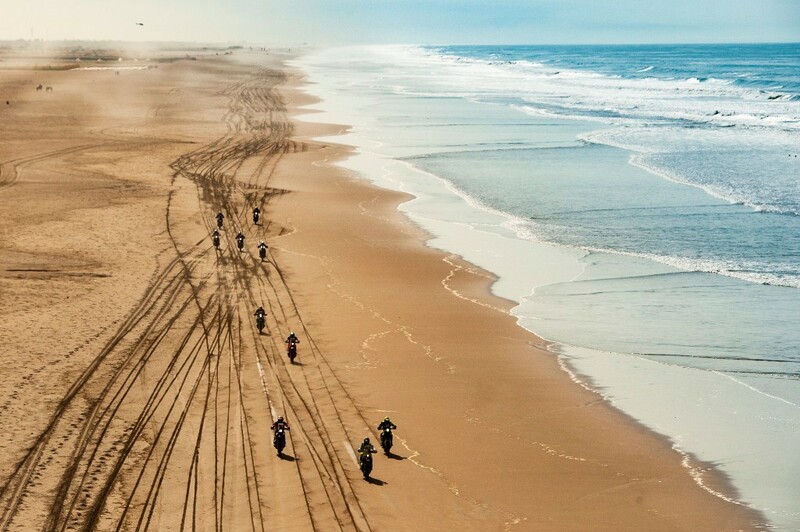 On the plus side this means Dakar organizers are being proactive to the dwindling number of places this planet has that can allow people to range over huge expanses of natural terrain. Although the rally has a serious lean toward leaving only tire tracks behind, the sheer number of racers and support vehicles means a whole lot of tire tracks. Without a doubt 2020 will be something to look forward to, as the KTM juggernaut looks for 19 in a row and hundreds of privateers look to have the adventure of a lifetime. Dakar organizers have an environmental plan that aims to leave only tire tracks behind after the event. Photo: ©ASO; C. Lopez.